Annaly Capital Management, American Capital Agency and Two Harbors Investment have fantastic yields at great prices. To say investors are uncertain about U.S. markets is an understatement. Prognosticators have been calling for a 30% to 50% correction since last summer, but so far, 2016 must feel like a sneeze that just won't come. Still, it's a good time to take precautions by investing in dividend-paying stocks. They're a smart bet for income in a low-yield, risky world. Even in the case of a correction, they will generate a reliable stream of income and present an opportunity to buy more shares at a discount to generate more income. Consider Annaly Capital Management (NLY - Get Report) , American Capital Agency (AGNC - Get Report) and Two Harbors Investment (TWO - Get Report) , three mortgage Real Estate Investment Trusts (mREITs) that offer yields of over 10%. Shares of all three fell slightly in Tuesday trading. Annaly Capital Management, invests in various mortgage-backed securities (MBSs) covered by government-sponsored entities like Fannie Mae and Freddie Mac. The company deals more heavily in business loans than the other two companies on this list. So far, this year the company's share price is up over 13% to $10.80. Annaly confirmed its 30-cent dividend earlier this month for an 11% dividend yield. Some sites might be reporting a dividend yield around 10% due to annualizing the company's recent quarterly dividend of 26 cents. Annaly issued this dividend to prepare its books for the acquisition of Hatteras Financial. American Capital Agency invests in residential MBSs covered by the U.S. government as well as government-sponsored entities. The company's share price is up over 11% so far this year to just under $20. 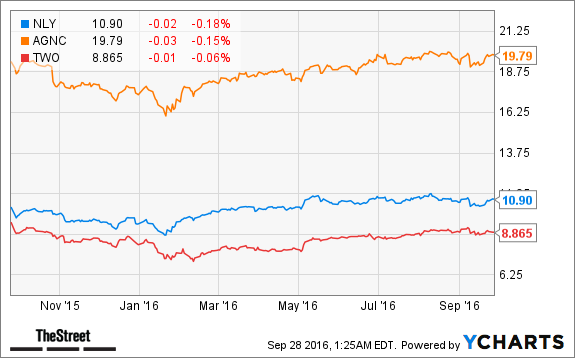 Unlike the other REITs on this list AGNC pays out its 11% dividend yield monthly. For investors that have Dividend Reinvestment Plans (DRIPs) set up, this means that the income earned from American Capital's dividend will be greater than for companies who distribute their dividend quarterly. As the name suggests, a DRIP reinvests dividends immediately back into the stock, which also avoids being charged commissions for buying new shares. Income that is compounded more frequently (monthly rather than quarterly) will increase the total amount of income received. It amounts to a time-proven way to steadily build wealth. The smallest company on this list, Two Harbors Investment, is a hybrid mortgage REIT, meaning that it invests in both commercial and residential MBSs and loans. Its share price is up 10% so far this year to $8.90. The company declared its most recent quarterly dividend of 23 cents on Sept. 15 for an annual dividend yield of 10.4%. Shares of Two Harbors trade at a bargain. The company reported an accounting book value of $9.83 per share in its second-quarter earnings release. This means that the company's stock currently trades at a 10.5% discount to its current price. Double digit yields at bargain prices are the best kind of yields. We've found a genius trader who turned $50,000 into $5 million by using his proprietary trading method. For a limited time, he's guaranteeing you $67,548 per year in profitable trades if you follow his simple step-by-step process. Click here now for details. The author is an independent contributor to TheStreet.com. At the time of publication, he owned none of the stocks mentioned.